Still, the labor market remains a pillar of support for the economy amid signs that activity was easing because of the fading boost from a $1.5 trillion tax cut package and the effects of interest rate increases over the last few years. The economy is also facing headwinds from slowing global growth and the United States' trade war with China. "The February job openings data reinforced that the labor market weakened in February but there isn't any cause for concern," said Ryan Sweet, a senior economist at Moody's Analytics in West Chester, Pennsylvania. The drop in job openings in February likely does not change the theme of labor shortages in the economy. A survey of small businesses published on Tuesday found that just over a fifth of owners reported difficulties finding qualified workers as their "single most important business problem" in March. 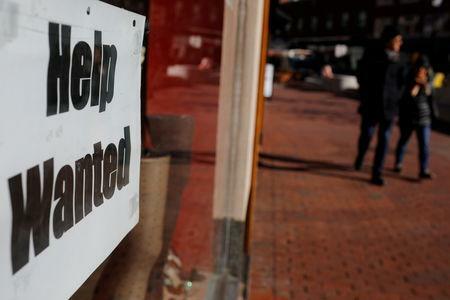 "There are still millions of help wanted signs out there in the country so we hesitate to revise our outlook for the labor market overall," said Chris Rupkey, chief economist at MUFG in New York. "This is not as many quits as you would expect in such a tight labor market, when workers are in higher demand," said Nick Bunker, an economist at Indeed Hiring Lab. "Though perhaps this isn't surprising in the short term given that the ratio of unemployed workers to job openings has been rising."